Behind every great beauty editor is a stash of awesomely enviable new finds, make-up, and skin and hair care samples which seemingly arrive by the pound on a weekly basis. Now, one innovative company wants to let you in on the next best beauty secret. Birchbox is sweeping the country by storm, a new service where a perky pink box full of 4-5 curated, deluxe beauty samples arrives on your doorstep each month. Samples are tailored to the beauty profile you create, and can range from favorites like NARS illuminators and Deborah Lippmann polish removers to hair accessories and sweets. Plus you can go to Birchbox.com to learn more about what’s in that month’s box and watch how-to interviews and more. 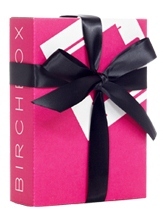 Birchbox offers both monthly and yearly subscriptions: $10 a month or $110 for a yearly membership (free shipping). Members can earn reward points for rating the samples, purchasing full-size products and referring friends. For about the price of a pair of Venti lattes, what a great way to try new fab finds! Learn more about Birchbox by clicking here. Birchbox provided me with a sample men’s and women’s box. Opinions expressed are my own.